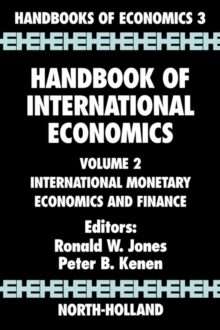 The first volume deals with the "real side" of international economics. It is concerned with the explanation of trade and factor flows, with their main effects on goods and factor prices, on the allocation of resources and income distribution and on economic welfare, and also with the effects on national policies designed explicitly to influence trade and factor flows. In other words, it deals chiefly with microeconomic issues and methods. The second volume deals with the "monetary side" of the subject. It is concerned with the balance of payments adjustment process under fixed exchange rates, with exchange rate determination under flexible exchange rates, and with the domestic ramifications of these phenomena. Accordingly, it deals mainly with economic issues, although microeconomic methods are frequently utilized, especially in work on expectations, asset markets, and exchange rate behavior.